The Stuttgart Region has no fewer than 23 starred restaurants, ten of them in the state capital alone. With the "Top Air", Stuttgart also boasts Europe's only starred airport restaurant – since 1991, what's more. The highest star, geographically speaking, shines over the "Wielandshöhe", where guests can enjoy not only good food, but also the wonderful view over the Stuttgart valley basin. Not starred, but no less excellent is Swabia's regional cuisine. Wine bars and temporary broom taverns serve Maultaschen (filled pasta), also known as "Herrgottsb’scheißerle" (lit. "swindlers of the Almighty", lentils with Spätzle (noodles) or fried steak. The ideal accompaniment is a local wine. These range from Lemberger to Syrah and from Chardonnay to Riesling. Not only a joy to drink: the Stuttgart Region's vineyards are perfect for long walks. Owing to Stuttgart's unique location, they stretch right into the centre of town. In the past 20 years, the quality of the region's wines has improved immensely. Local vintners regularly win international awards. This year's winners of the German Red Wine Award include the Weinmanufaktur Untertürkheim and Weingut Jürgen Ellwanger. Thanks to its topography, the Stuttgart Region also scores with its numerous lookout points and idyllic locations, some with catering. In Stuttgart, glasses are raised not only with wine, but also with beer. Next year the Stuttgart Beer Festival will be even more in the limelight than usual, when it celebrates its 200-year jubilee. From 26th September to 3rd October, in the heart of Baden-Württemberg's state capital, people will commemorate the festival's founding by King Wilhelm I of Württemberg and his wife, Queen Katharina. There will be a "Historical Festival" on Palace Square, with nostalgic fairground rides and showmen in the tradition of the 19th and 20th centuries. Parallel to this, the popular Stuttgart Beer Festival will of course be held as usual on the Cannstatter Wasen fairground, where Stuttgart's large breweries keep the beer flowing freely in the festival marquees. There are also countless other traditional festivals held each year in the Stuttgart Region, such as the Filder Cabbage Festival, the Esslingen Onion Festival and the Stuttgart Wine Festival. Germany's oldest producer of sparkling wines. "Ritter Sport" square chocolate bars also come from the Stuttgart Region, as does Hochland coffee from the roastery with a long tradition. Especially for the themed year "Enjoyment", the Stuttgart-Marketing GmbH will be cooperating with ten enjoyment ambassadors who have a culinary connection with the Stuttgart Region. Their testimonials introduce their favourite places for enjoyment, describe what is typical for the region and explain which culinary specialities bon vivants simply mustn't miss. The Michelin-starred chef Vincent Klink's favourite place to shop, for example, is Stuttgart's Market Hall, for the young wine grower Moritz Haidle, fine wine and good food are an integral part of the Stuttgart Region, while the food blogger Christine Garcia Urbina recommends a hike through the vineyards. The hashtag #tastystuttgart was introduced in September 2017 to support the other social media measures, for all the usual Stuttgart-Marketing channels. The Stuttgart Region offers a huge range of culinary delicacies: from exquisite starred restaurants to down-to-earth traditional fare, sparkling wines and sweet delights. The ten specialists below, whose professions all have to do with creating enjoyment, are just some examples of the many different facets of the Enjoyment Region of Stuttgart. Starred chef Vincent Klink – a Michelin star has been shining over his "Wielandshöhe" restaurant without a break since 1991 – cultivates not only haute cuisine, but also the tradition of typical regional dishes. He places particular importance on the quality of the ingredients used, on organically-grown vegetables and species-appropriate animal husbandry. Klink likes to buy his favourite regional produce at Stuttgart's Art Nouveau Market Hall, which was built in 1914. The Swabian restaurateurs Ferdinand and Maximilian Trautwein pursue a style of cooking that is firmly rooted in traditional Swabian cuisine. At their "Gasthaus zur Linde" the food is presented in a modern look that delights the eye as well as the palate. One of their favourite ingredients is Filderkraut, a local variety of pointed cabbage that grows on the fields of the Filder plateau south of Stuttgart. 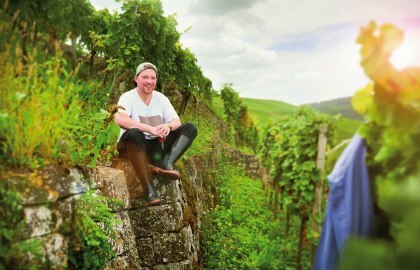 The young wine grower Moritz Haidle is one of the most successful wine producers in the Stuttgart Region and one of Germany's 60 best young vintners. In 2014 he took over the Karl Haidle wine estate in Stetten from his father, where he now carries on the family tradition. To him, not only good wine, but also good food and good automobiles are an integral part of the Stuttgart Region. The Stuttgart Region is known not only for its wines, but also for its Sekt, or sparkling wine. The Sektkellerei Kessler was founded in Esslingen more than 190 years ago. Achim Silberhorn, its brand ambassador, shows interested visitors round the company's medieval vaulted cellars and explains about traditional production methods and bottle fermentation. How fitting that his favourite lookout point is surrounded by vineyards: the Royal Burial Chapel on the Württemberg. Carl Peter Dinkelacker, a partner in the brewery of the same name founded by his great-grandfather, devotes himself to the "juice of the barley", i.e. beer. Even more than 130 years on, Carl Peter Dinkelacker still sets great store by old-fashioned brewing skills using traditional recipes and regional ingredients. Karl Maier, the festival host of the "Göckelesmaier" ("Chicken Maier") beer tent also stands for a long tradition. Over 80 years ago his father was the first to sell crisply grilled chickens at the Stuttgart Beer Festival, and since the late 1990s Karl Maier junior has carried on the company legacy with the help of his wife. When asked about his personal insider tip, Maier recommends a ride on the historical funicular railway from Heslach up to the Waldfriedhof woodland cemetery. Stuttgart also has it sweeter aspects: at her patisserie the pastry cook Aline John creates dainty, individually designed cakes, some of them based on her grandmother's recipes. "Wunderland", "Goldbarren" or "Flamingo" are just a few of her specialities. Aline John finds pure enjoyment when she walks round Stuttgart's weekly market. To Esther Weeber-Kirschenlohr, the proprietress of the "Penguin" ice cream parlour, quality always comes first – as anyone who tastes her ices will realise. Her favourite view over Stuttgart's city centre is from Eugensplatz. Christine Garcia Urbina, alias trickytine, is passionate about cooking, baking, travel and photography, all of which feature in her blog. Enjoyment naturally plays an important role in her life. To her, a hike through the vineyards around Stuttgart is just as typical of the region as a buttered pretzel or home-made Maultaschen (filled pasta). Sabine Wacker is a city and enjoyment guide who introduces lovers of good food to the region's cuisine and culinary traditions. A native of Swabia, she likes to eat at typical broom taverns and enjoys the panorama from Stuttgart's Television Tower. 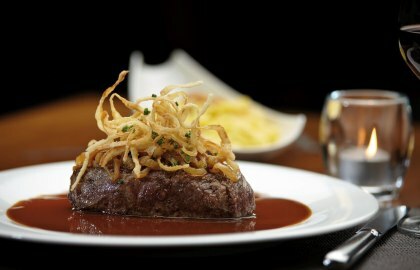 More information on the ten testimonials and the Enjoyment Region of Stuttgart can be found under www.tastystuttgart.de. In the Stuttgart Region people know all about enjoyment. Whereas Stuttgart was once known as the "chocolate capital of Germany", it now has a reputation far beyond the city boundaries as a wine-growing region. Within the framework of its theme for the year 2018 – "Enjoyment" – Stuttgart Marketing is also highlighting regional products and Swabian specialities. Maultaschen (filled pasta), Gaisburger Marsch (hotpot) and Linsen mit Spätzle (lentils with noodles) are omnipresent in the Stuttgart Region. Together with Rostbraten (fried steak), Kartoffelsalat (potato salad), Kässpätzle (cheesy noodles) and Ofenschlupfer (bread pudding) they are the most popular Swabian dishes. Some of these represent Swabian frugality in its nicest form: the day's leftovers end up in the stockpot or hidden inside pasta dough. The Swabians' favourite snack is the Brezel (pretzel), which can be enjoyed at any time of day, with or without butter. Legend has it that it was born of necessity: apparently in the 15th century a baker was given the chance to avoid the death penalty if he created a kind of bread roll with three holes through which the sun could shine. Swabian specialities are best enjoyed in traditional wine bars or the temporary broom taverns run by wine growers. To show they're open for business they hang a broom at the door. Only the vintners' own wines can be served here, usually in the typical local glasses with a handle. Even if it is rarely remembered today, at the beginning of the 20th century Stuttgart was known as a "chocolate city". Waldbaur – famous for its chocolate "cat tongues" – and the Moser-Roth and Eszet chocolate factories were located here. Ritter Sport has continued to thrive into the present day. In 1912 Alfred Eugen Ritter and his wife Clara founded a chocolate and confectionery factory in Stuttgart-Bad Cannstatt. Nearly 90 years ago the company relocated to larger premises in Waldenbuch, where the company still has its headquarters. It was also Clara Ritter who devised the square-shaped chocolate bar. She had the idea of producing a chocolate bar that would fit into the pocket of a sports jacket without breaking, yet weighed the same as a rectangular bar – that was the birth of the original name "Ritter's Sport Chocolate". granddaughter. In addition to coffee and two Holanka coffee bars in Stuttgart, Hochland has also had its own chocolaterie since 2010. Barley or grape juice – beer or wine? Stuttgart can score with both. The Dinkelacker family brewery, founded by Carl Dinkelacker, has been brewing beer in Stuttgart for 130 years now. In 1900 it was also the first brewery in Stuttgart to produce a type of beer brewed in the Pilsner tradition, now known under the name of CD-Pils. Some years previously Ernst Immanuel Wulle had founded his brewery of the same name. In 1971 the brewery was taken over by Dinkelacker, and in 2008 the cult beer "Wulle" reappeared on the market. In the Stuttgart Region wine is a dominant theme. The state capital of Stuttgart is the only German metropolis with its own municipal wine estate, with a total area of 17.5 hectares spread over six different locations. Vineyards also define the region's landscapes and look back on a long tradition. This is what attracted Georg Christian Kessler to settle in Esslingen in 1826, where he founded Germany's first sparkling wine factory – now the oldest in Germany. For those who would like to enjoy the local wines in their own home, a large selection can be found at Feinkost Böhm, the Market Hall and the Weinhandlung Kreis.